DA AFGHAN OMER MUMTAZ BANK (D.A.O.M.BANK) "Gateway to Afghanistan's riches"
During many years of war specially during the civil war, our beloved country, Afghanistan, has sustained different damages. Due to these wars besides the destruction of social and administrative system, the economical order of our beloved country have sustained extreme damages. As a result, the people of this war ravaged territory are suffering because of the harms and extreme sad consequences of the war, besides parallel to this our people have become completely sensitive regarding the financial affairs and are distrustful about the banking transactions. Therefore, in order to actively participate in rehabilitation economical development social affairs and urgent needs of our country Afghanistan "Da Afghan Omer Mumtaz Bank", as a joint stock in the frame of the private sector will be established. 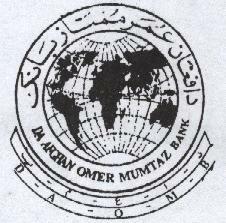 The Founder and President of the Suprem Council of D.A.O.M.Bank Muhammad Omar Mumtaz was a well known business man in the 60's. In 1964 the President imported 200 oil tankers from International Harvester in chicago through a letter of credit from The Bank of America in New York, for the amount of Two Million Dollars and established the Afghan Mumtaz Joint Stock Transport Company, in Kabul Afghanistan. Besides the transport corp, the founder also owns thousands of acres of farmland, commercial markets, buildings, residential and commercial properties in the provinces of Kabul, Nangarhar, Baghlan, Logar. The bank is not yet open. Once its open we will announce it's openning inshAllah.